A city weekly has taken its bid to save a speedway club to Parliament. 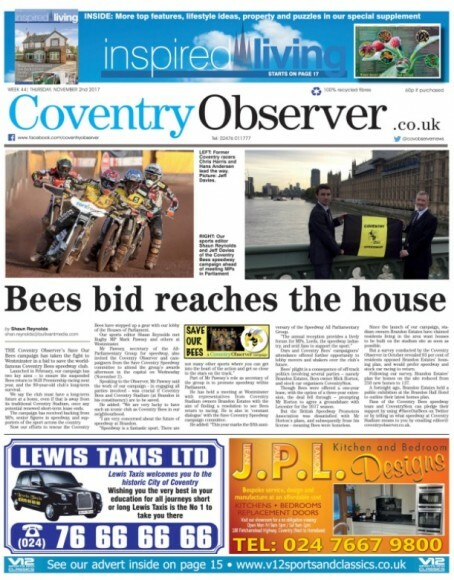 Coventry Observer launched its ‘Save Our Bees’ campaign earlier this year after Coventry Bees were told by the British Speedway Promoters Association that they would not be allowed to compete in the 2017 Speedway Great Britain Premiership due to a dispute over their stadium. Since then, Coventry Stadium owners Brandon Estates has announced plans to build 137 homes on the stadium site – a move which would put the Bees’ long-term future in significant doubt. Mark Pawsey MP, secretary of the All-Party Parliamentary Group for speedway, invited Observer sports editor and keen Bees fan Shaun Reynolds to Westminster to discuss the ongoing off-track battle. Mr Pawsey told Shaun he will “continue to defend Coventry Bees’ cause” when Brandon Estates submit their planning application, nad also highlighted Bees’ situation in a lengthy speech during the Parliamentary Group’s annual celebration ceremony. Shauntold HTFP: “Our campaign has two key aims. Firstly, we want Bees to return to SGB Premiership racing in 2018. We also want to ensure a long-term plan so Bees can look forward to a bright future away from their Brandon home should a potential lease end. “The club is, arguablym the most successful sporting team in the region. Bees won the Elite League Championship, the sport’s highest tier league, three times – in 2005, 2007 and 2010. They also lifted the British League five times, the Knockout Cup three times, and the prestigious Craven Shield on four occasions.